Wintering deer and elk can cause extensive browsing damage to forest plantations. This study was undertaken to identify the cost-effectiveness of two repellents (Plantskydd and Deer-Away BGR Liquid) and Vexar bud caps in reducing browse damage to conifer seedlings. Three plantations located on traditional winter range were selected for the study. The 3 sites were rated by pellet group counts as either elk range, deer range, or both elk and deer range. Treatments were applied to each site in the fall of 2000 in a randomized block design. Trees were then surveyed for damage 5-6 months later once snowmelt had occurred and the animals had migrated to higher elevations. 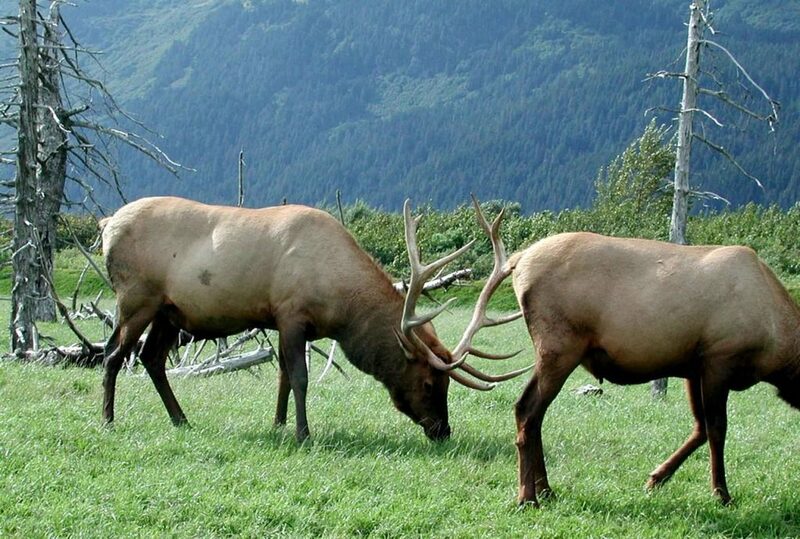 All three treatments were equally effective in reducing terminal browse damage by up to 42% when compared to controls on the elk range and deer range sites. However, the site with equal deer and elk use received low browse pressure and no treatment differences for terminal damage were detected. The results of this study should be interpreted with caution, as the winter of 2000-01 was relatively mild in northern Idaho, resulting in a snowpack of 50% of normal. Thus, browse pressure may also have been less-than-normal. Nevertheless, the 3 treatments tested appear to be effective in reducing both deer and elk winter browsing of conifer seedlings at low to moderate levels of browsing pressure. The negative effects of white-tailed deer (Odocoileus virginianus) and elk (Cervus elaphus) browsing on forest plantation establishment and forest regeneration have been thoroughly documented (Crouch 1976; Anderson and Loucks 1979; Marquis and Brenneman 1981; Alverson et al. 1988; Tilghman 1989; Moser and Witmer 2000). Browsing impacts can be compounded during the winter and early spring months when ungulate populations are concentrated on winter ranges (Gaffney 1941; Secord et al. 1999). Ungulate browsing on conifers can result in stem deformities, reduced growth, and even death (Crouch 1966), resulting in an economic loss (Weigand et al. 1993). A number of non-lethal approaches of varying effectiveness are available to address ungulate damage to conifer seedlings. Rigid Vexar tubing has been used to effectively reduce deer browsing both by enclosing the entire tree and by enclosing the terminal leader (Campbell and Evans 1975; Anthony 1982; DeYoe and Schaap 1984). However, a number of problems may be encountered with the use of rigid tubing, including stunted tree growth, stem deformities, and collapse of tube and seedling due to heavy snowpack and/or trampling by animals (Campbell and Evans 1975). In addition, difficulty of handling due to bulkiness as well as high costs of material and labor make rigid tubing an unlikely method for all but the most valuable forest plantations. Flexible Vexar netting has also been used to effectively reduce deer browsing on conifer terminals (De Yoe and Schaap 1984). This material is less expensive than rigid tubing and easier to apply. However, deformities to both lateral branches and terminal leaders may occur, and netting may blow off in high winds (De Yoe and Schaap 1984). Repellents are another non-lethal approach to controlling deer and elk damage to conifer seedlings. Deer-Away BGR has been shown to deter elk from feeding on various forages (Andelt et al. 1992; Witmer et al. 1997; Baker et al. 1999). In addition, both Deer-Away BGR and blood meal has been shown to effectively reduce deer browsing on various forages (Harris et al. 1983; Palmer et al. 1983; Milunas et al. 1994; Witmer et al. 1997; Nolte 1998; Wagner and Nolte 2001). Nevertheless, topical repellents have their shortcomings, including limited effective duration due to weathering. The objectives of this study were to 1) compare the efficacy of flexible Vexar tubing as bud caps versus Deer-Away BGR and Plantskydd topical repellents in reducing deer and elk damage to conifer seedlings, and 2) compare the cost of application of these three materials. The study was conducted in mixed conifer forests of northern Idaho on lands owned and managed by Potlatch Corporation. Three recently harvested sites were chosen that were known to be historic winter range for white-tailed deer and/or elk. Two of the sites occurred on ponderosa pine (Pinus ponderosa) habitat types, while the higher elevation site was on a western redcedar (Thuja plicata) habitat type. Sites ranged in elevation from 604 to 878 m (0 = 784) and precipitation ranged from 66 to 114 cm (0 = 92), much of which fell in the winter as snow. Average annual temperature ranged from —10o C in February to 38o C in August. The 3 sites were clearcut and replanted with either ponderosa pine or western white pine (Pinus monticola) at a density of approximately 400 trees per acre. Site prep before planting included either broadcast burning or herbicide application to reduce competing vegetation. In order to assess deer and elk use of the sites during the winter of 2000-01, I conducted pellet group counts in May 2001 along 5 randomly located transects at each site. I systematically placed ten 50 m2 plots along each transect and counted pellet groups that I determined to be deposited within the past 6 months. I employed a randomized block design at each site to assess the efficacy of 3 methods to reduce winter ungulate browsing. I randomly located 5 blocks within each harvest unit. Experimental plots within each block consisted of 16 seedlings (approximate 4 x 4 plot), arranged adjacent to one another within the blocks with a one row buffer of trees between each plot. I randomly assigned 4 treatments, flexible Vexar bud caps, Deer-Away BGR Liquid, Plantskydd, and control, to one of the 4 experimental plots within each block. I applied all treatments on 23-25 October 2000. Repellents were applied with backpack sprayers as per label instructions. Bud caps were fitted over the terminal leaders, and bunched and stapled in order to secure them to the tree. No precipitation was recorded for at least 24 hrs following application of treatments. I assessed seedling damage after snowmelt at 5 months following treatment for the 2 lower elevation sites, and at 6 months for the highest elevation site. I recorded the percentage of trees in each plot that had 1) terminal bud damage only and 2) any browse damage. I also compared the cost of materials and application for the three treatments in this study with rigid Vexar tubes, even though these were not used in the field study. I used actual costs derived from operational applications of the 4 treatments during 2000 and 2001. I used a randomized block ANOVA to test for differences in browse damage among treatment means at each study site. I used Tukey’s multiple comparison tests to isolate significant differences (P < 0.05) among treatment means for all analyses. All percent data were arcsine-squareroot transformed prior to analyses (Steel et al. 1997). Pellet group counts indicated that one site was used primarily by elk, one by deer, and one equally by both deer and elk. Frequency of pellet groups was similar among all 3 sites. All 3 treatments reduced terminal bud damage when compared to the control on both the elk and deer sites (P < 0.013; Figures 1, 2). Browsing pressure was relatively low on the deer and elk site, and no significant differences in terminal bud damage were noted among treatments (P = 0.545; Figure 3). Significant differences for number of seedlings browsed were observed among treatments at all sites (P < 0.036). The 3 treatments effectively reduced browsing damage to seedlings when compared to the control on both the elk and deer sites (P < 0.036; Figures 4, 5). Bud caps significantly reduced browsing damage when compared to other treatments on the deer and elk site (P < 0.019), however the effects were minimal (Figure 6). Costs of material and labor in Table 1 indicate that Deer-Away BGR is the cheapest method, followed by Plantskydd, flexible Vexar bud caps, and then rigid Vexar tubing. Total 3-year costs indicate that Vexar tubing would be prohibitively expensive on all but the most valuable sites in northern Idaho. The total 3-year cost effectiveness of flexible Vexar bud caps is also questionable. Both repellents could be cost-effectively applied for 3-years, assuming that they effectively reduce browsing during all winters on all sites. All three materials tested in this study effectively reduced browsing of conifer seedlings by both deer and elk. My results are similar to published studies that have found that Deer-Away BGR and Plantskydd can effectively reduce browsing by deer (Nolte 1998; Wagner and Nolte 2001). In addition, Deer-Away BGR has effectively reduced elk foraging in some studies (Andelt et al. 1992; Witmer et al. 1997; Baker et al. 1999). Furthermore, DeYoe and Schaap (1984) reported that Vexar netting could effectively reduce deer and elk browsing on seedlings. However, the winter of 2000-01 was relatively mild in northern Idaho, with snowpacks averaging 50% of normal on all the study sites. This relatively low snowpack might have resulted in relatively low browsing pressure by reducing the frequency and duration of ungulate use of these traditional winter ranges. Therefore, these results should be viewed with caution until subsequent year’s data can be included in the analyses. This study is ongoing, and will continue until a winter with at least average snowpack is encountered. In some cases seedlings treated with bud caps had more terminal damage than those treated with repellents. It appears that the elk in some cases learned how to remove the bud caps and then browse the terminals. These were isolated incidents, but when it occurred the animals tended to apply this behavior to a large area (15-20 seedlings). Otherwise, as long as the bud cap remained on the tree it provided 100% protection. Deer-Away BGR and Plantskydd both cost-effectively reduced browse damage to conifer seedlings in this study, and thus they may offer protection during years with low to moderate levels of snowpack. However, they may not provide the level of protection necessary under levels of high browse pressure. Under these conditions, physical barriers such as Vexar tubing or flexible Vexar bud caps may be necessary to completely protect seedlings, even though these methods are 2 to 3 times more expensive than repellents. Since it is impossible to predict annual snowpack on a given site, the only way to ensure protection is to use a physical barrier. Table 1. Relative costs of 2 repellents and 2 physical barriers to reduce deer and elk damage to conifer seedlings, based on operational costs during 2000-01. Figure 1. Mean percentage of terminal buds browsed on elk winter range site. Means followed by the same letter are not different (P > 0.05). Figure 2. Mean percentage of terminal buds browsed on white-tailed deer winter range site. Means followed by the same letter are not different (P > 0.05). Figure 3. Mean percentage of terminal buds browsed on white-tailed deer and elk winter range site. Means followed by the same letter are not different (P > 0.05). Figure 4. Mean percentage of seedlings browsed on elk winter range site. Means followed by the same letter are not different (P > 0.05). Figure 5. Mean percentage of seedlings browsed on white-tailed deer winter range site. Means followed by the same letter are not different (P > 0.05). Figure 6. Mean percentage of seedlings browsed on white-tailed deer and elk winter range site. Means followed by the same letter are not different (P > 0.05). ALVERSON, W.S., D.M. WALLER, and S.L. SOLHEIM. 1988. Forests too deer: edge effects in northern Wisconsin. Conservation Biology 2:348-358. ANDELT, W.F., D.L. BAKER, and K.P. BURNHAM. 1992. Relative preference of captive cow elk for repellent-treated diets. Journal of Wildlife Management 56:164-173. ANDERSON, R.C. and O.L. LOUCKS. 1979. White-tail deer (Odocoileus virginianus) influence on structure and composition of Tsuga canadensis forests. Journal of Applied Ecology 16:855-861. ANTHONY, R.M. 1982. Protecting ponderosa pine from mule deer with plastic tubes. Tree Planters’ Notes 33:22-26. CAMPBELL, D.L., and J. EVANS. 1975. Vexar seedling protectors to reduce wildlife damage to Douglas-fir seedlings. USDI Fish and Wildlife Service, Wildlife Leaflet 508, Washington, D.C.
CROUCH, G.L. 1966. Effects of simulated deer browsing on Douglas-fir seedlings. Journal of Forestry 64:322-326. CROUCH, G.L. 1976. Deer and reforestation in the Pacific Northwest. Proceedings of the Vertebrate Pest Conference 7:298-301. DEYOE, D.R., and W. SCHAAP. 1984. Comparison of 8 physical barriers used for protecting Douglas-fir seedlings from deer browse. Proceedings of the Eastern Wildlife Damage Control Conference 1:77-93. GAFFNEY, W.S. 1941. The effects of winter elk browsing, South Fork of the Flathead River, Montana. Journal of Wildlife Management 5:427-453. HARRIS, M.T., W.L. PALMER, and J.L. GEORGE. 1983. Preliminary screening of white-tailed deer repellents. Journal of Wildlife Management 47:516-519. MARQUIS, D.A., and R. BRENNEMAN. 1981. The impact of deer on forest vegetation in Pennsylvania. USDA Forest Service GTR-NE-65. 7 pp. MILUNAS, M.C., A.F. RHOADS, and J.R. MASON. 1994. Effectiveness of odour repellents for protecting ornamental shrubs from browsing by white-tailed deer. Crop Protection 13:393-397. MOSER, B.W., and G.W. WITMER. 2000. The effects of elk and cattle foraging on the vegetation, birds, and small mammals of the Bridge Creek Wildlife Area, Oregon. International Biodeterioration and Biodegradation 45:151-157. NOLTE, D.L. 1998. Efficacy of selected repellents to deter deer browsing of conifer seedlings. International Biodeterioration and Biodegradation 42:101-107. PALMER, W.L., R.G. WINGARD, and J.L. GEORGE. 1983. Evaluation of white-tailed deer repellents. Wildlife Society Bulletin 11:164-166. SECORD, M.L., P.E. ZAGER, and D.H. PLETSCHER. 1999. The influence of temporal and spatial factors on clearcut use by white-tailed deer in northern Idaho. Western Journal of Applied Forestry 14:177-182.
statistics: a biometrical approach. Third Edition. McGraw-Hill, NY. 666 pp. TILGHMAN, N.G. 1989. Impacts of white-tailed deer on forest regeneration in northwestern Pennsylvania. Journal of Wildlife Management 53:524-532. WAGNER, K.K., and D.L. NOLTE. 2001. Comparison of active ingredients and delivery systems in deer repellents. Wildlife Society Bulletin 29:322-330. WEIGAND, J.F., R.W. HAYNES, A.R. TIEDEMANN, R.A. RIGGS, and T.M. QUIGLEY. 1993. Economic assessment of ungulate herbivory in commercial forests of eastern Oregon and Washington, USA. Forest Ecology and Management 61:137-155. WITMER, G.W., R.D. SAYLER, and M.J. PIPAS. 1997. Repellent trials to reduce reforestation damage by pocket gophers, deer and elk. Pages 321-332 in J.R. Mason, editor. Repellents in wildlife management: Proceedings of the symposium, 8-10 August 1995, Denver, Colorado. National Wildlife Research Center, Fort Collins, Colorado, USA.